A good bachelor party doesn’t let the groom-to-be get through the night easily. Creating several “challenges” for the groom to attempt throughout the night isa great way to add to the overall fun of the evening. Because, honestly, what bachelor party guest doesn’t want to watch the groom try to get random girls to sign his t-shirt? We were recently informed that one of our top selling products has spawned a bachelor party game all of its own. The Maxam 64oz. Jumbo Flask is certainly an eye-catcher. However, in this instance, the flask is for the groom. 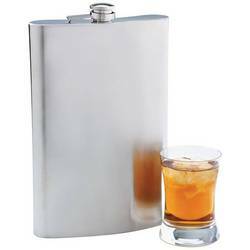 The challenge (or death sentence) is for the groom to start the night with a full jumbo flask and finish it by the end of then night. He has to drink the entire flask himself UNLESS he can get phone numbers from girls. If he is successful in doing that, he is allowed to pour her a shot. **NOTE This girl is not chosen by the groom, but rather the groomsmen which makes for a nice little twist. We didn’t believe this when we heard it, but we did some research and actually found some bachelor parties where this game has taken place. Now, that’s what we call bachelor party entrepreneurship. This entry was posted on Thursday, February 12th, 2009 at 2:41 pm	and is filed under Bachelor Party. You can follow any responses to this entry through the RSS 2.0 feed. You can leave a response, or trackback from your own site.